Picture the Amazon Rainforest in its unspoilt glory, circa 1541. Between the leaves and vines moonwalks Gonzo, a Conquistador renegade on the hunt for the lost treasure of El Dorado, the city of gold. It’s a theme rife for the picking. No wonder NetEnt – one of the top online slots developer in Sweden…and the world. Chose it as the perfect story to play out over five reels and 20 pay-lines. 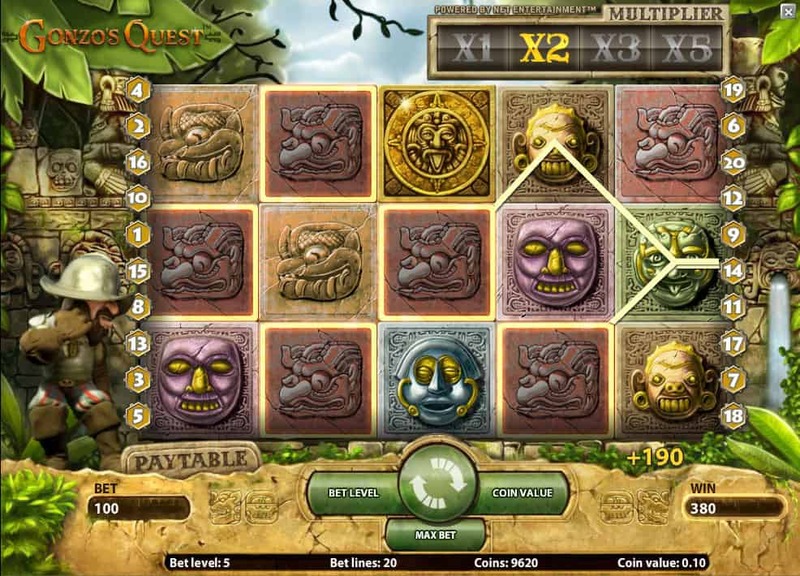 We’re right along with the Gonzo’s Quest Slot in his – and our – search for riches. NetEnt loves an intro. Gonzo’s Quest leads us superbly into the action with an unparallelled setting of scene and character. Gonzo then appears by our reel case, made up of a wall of individual Inca Heads. Each one of these heads acts as a game symbol, helping Gonzo on his road to riches with each winning combination. And while Gonzo is a fun companion in the base game, he truly springs to life when the wall of Inca Heads parts and we cast our eyes on Eldorado for the onset of the Free Falls bonus feature. Watch out for his moonwalks when we land those big wins we’re after. 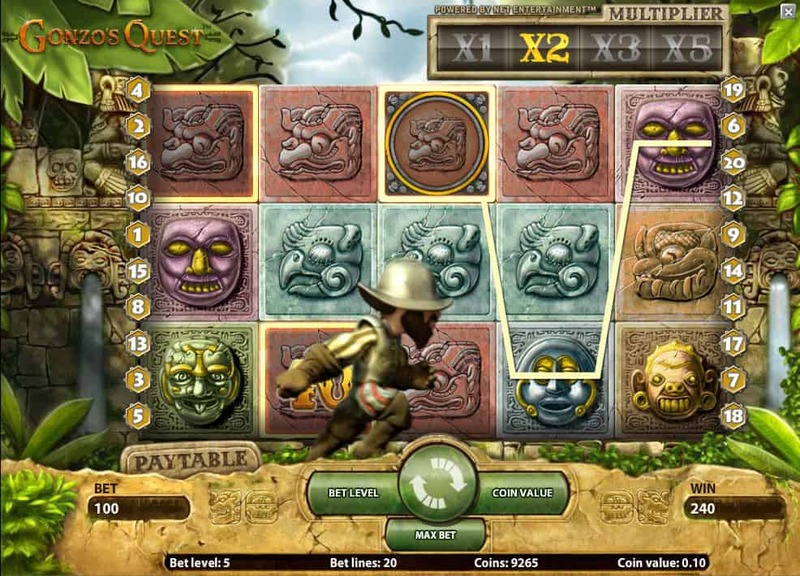 Gonzo’s Quest operates the separate Coin Bet and Bet Level options that NetEnt likes to use on many of its modern slots. We can toggle these options either side of the spin button, always playing on the game’s 20 paylines. 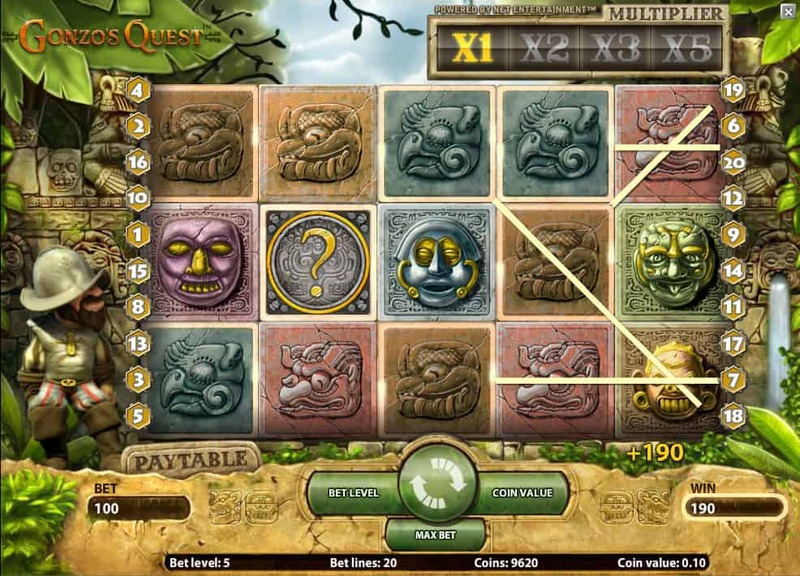 But while our payouts for winning combos are based on the symbol multiplied by the bet per line, Gonzo’s Quest uses Avalanche Multipliers™ to boost our win potential for every spin. Any symbols forming winning combos across the slot’s 20 paylines explode in puffs of smoke, with new symbols falling into their places. 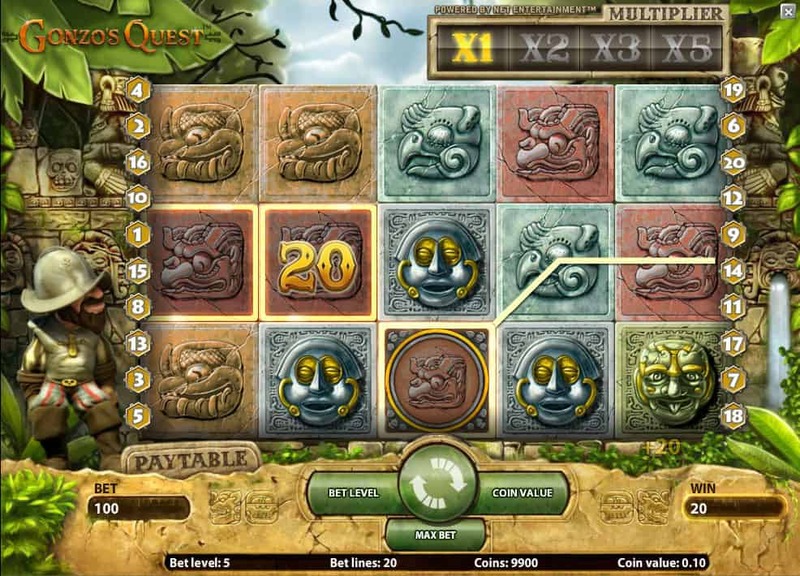 Increasing multipliers accompany concurrent wins, between x1 - x5 during the base game and between x3 - x15 during the Free Falls bonus feature. Landing three Golden Sun Scatters triggers the bonus game, while the Question Mark Wild substitutes for all symbols including Scatters. 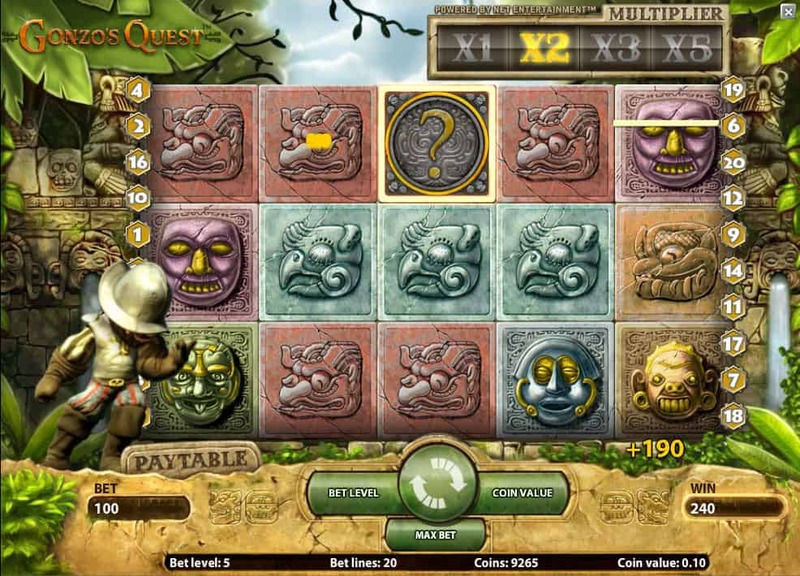 NetEnt’s Gonzo’s Quest online slot has earned five star reviews since its release in 2010, with the lead character still proving the poster boy for NetEnt’s website and many other online slots providers. No wonder that Gonzo was first on the team sheet when it came to NetEnt’s release of its Touch™ mobile platform. 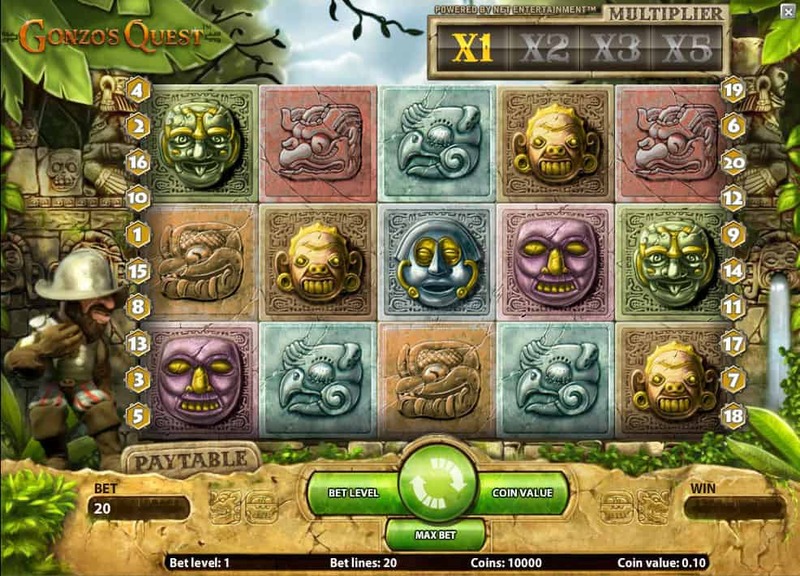 Gonzo made the jump easily, and his quest still proves one of slots fans’ favourites to this day. A must-play regular for any slot fan.